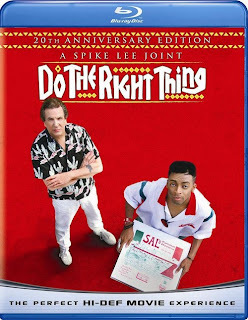 Do The Right Thing (20th Anniversary Edition): Spike Lee's masterpiece hits DVD and Blu with a new transfer and some addtional supplements; it's really one of the great films of the last couple of decades, and if you haven't seen it, do so. Some folks on the Internet are all up arms over the new transfer, which alters the yellow hue of Criterion's DVD a few years back; frankly, I've seen the movie multiple times over the years and wouldn't have noticed any chance had I not seen the frame-to-frame comparisons that are floating around. I stand by my five-star review of the video quality. Two Lovers: James Gray's thoughtful, quiet, low-key character study is a fine showcase for the considerable (onscreen) talents of Joaquin Phoenix, while Gwyneth Paltrow does her best film work in years. That's about it; it's a pretty slim week on disc. However, we had just cancelled HBO when Eastbound & Down hit the air, and I've heard great things about it (particularly from my colleague Jamie S. Rich), so I'll give it a look-see when I can.